We Made it to Oprah's Favourite Things! 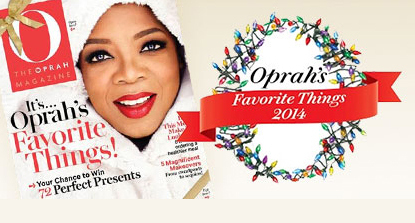 Our Sacred Nature Organic Body Butter from [comfort zone] made it to Oprah’s Favourite Things this holiday season. After experiencing its nourishing, anti-oxidant properties, she reportedly purchased an entire case! For those with slightly more limited funds, we’re offering this exclusive product via our online store at 25% off plus FREE SHIPPING (a $34.50 savings! ), just in time for holiday gift-giving. Enter code OPRAH upon checkout. Hurry, offer ends December 6th, while quantities last.